You've really started something here at Shields Timber Buildings. A whisper at first, like a little acorn, has turned into a crescendo of people asking for mighty oak constructed buildings. And it's of little surprise really, after all it's the timber that defines the British countryside, robust, hard wearing and strong. Beyond its hardy character is the beautiful light wood colouring and the grain which is deep offering an extra texture that draws the eye every time you happen to glance its way. It goes some way to describing why the display here at North Tawton, Devon has a new offering in pride of place - a 6m x 5.3m Oak fronted Carport. The Oak fronted Carport is finished with Lindab galvanised guttering and Tapco synthetic slate roofing, so your walk to the car during the frosty mornings suddenly becomes one of life's pleasures. It really is such a work of art, you will love the superb attention to detail that has gone in to all the elements of this building. It is of course made to the high standard that you have come to expect from Shields Buildings products, but with the English Oak frontage you have the added joy of wooden pegs on the curved braces and moulded staddle stones for the Oak posts to sit on. 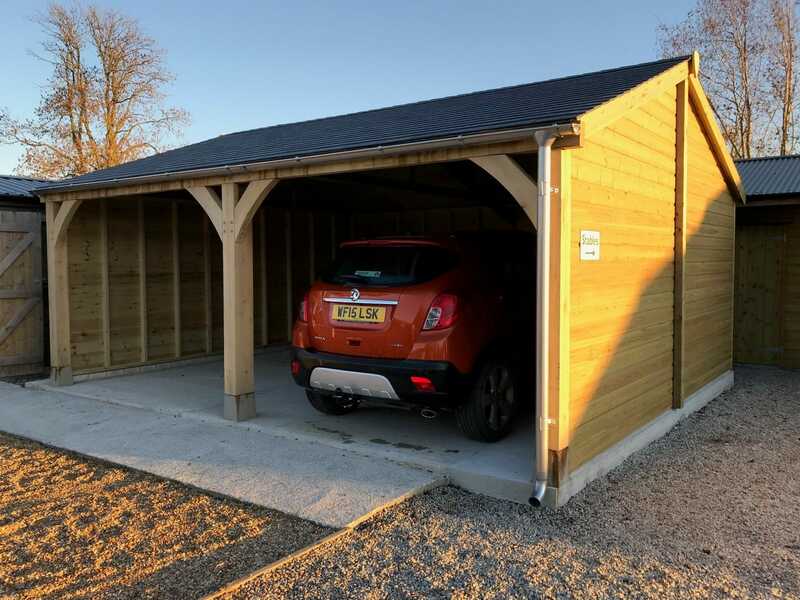 Being bespoke you can have your Oak fronted Carport the size that you require, single, double or triple and at the depth that gives you the perfect fit for your vehicle. When you see the Carport we are sure you'll agree it's something to celebrate! Call us on 01837 82442 for more details or to discuss your requirements.